What’s wrong with SaskTel Centre? I didn’t live in Saskatoon when the facility was built in 1988 but from what I’ve read the location was as controversial a point then as it is now. Saskatoon’s City Council recently commissioned a report to investigate the feasibility of a downtown arena development, researched by the group that helped Edmonton develop their Ice District. To figure out why the discussion has come up, it may be prudent to take a look back. 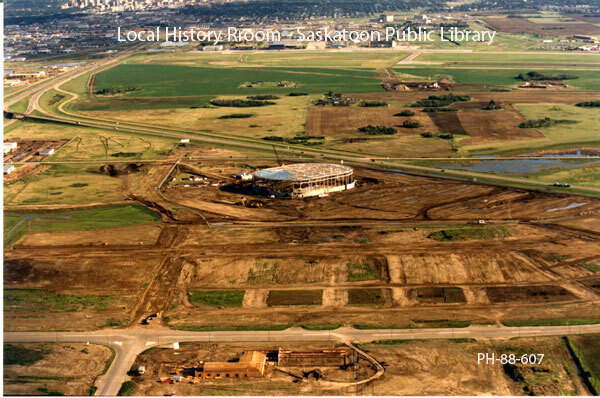 The original name of Saskatoon’s largest sports arena was SaskPlace. I, like many people, still refer to it by its first moniker despite sponsorship name changes over the years. Ironically it was built to replace an existing concrete block downtown arena nicknamed the Barn. There were really only two sites in the running at the time: near the original site approximately where Persephone stands, and where the arena was eventually built in AgriPlace Industrial. The site held criticism from day one regarding transit access along with planned interchanges to improve access that never transpired. Just in 2015, the traffic lights at the intersection of Marquis Drive and Highway 16 showed up 27 years after SaskPlace was opened. It should be pointed out that SaskTel Centre is one of two facilities the report identified. The other City owned convention centre is the already centrally located, but considerably smaller, TCU Place. Both are getting up there in years. When SaskPlace was built there were very few businesses in the area and not much has changed from a service provider perspective. The Motel 6 was built in 2004 and includes a Tim Hortons; a second hotel was added in the last decade. The arena hosts 20-25 concerts per year and approximately 120 days of annual events. As with any large municipal investment, a project of this scope will take years to develop. The cost to renovate is high at $101 million and won’t solve the biggest gripe to many taxpayers: the location that we can’t just can’t console ourselves to love. The impact a new arena could bring to downtown retail, hospitality and restaurant services could be the catalyst Saskatoon needs to really blossom an already buzzing downtown core. The price tag is not for the faint of heart with a new arena estimated at $179 million. Combining the facility with TCU Place to become a convention centre jumps from $330 to $375 million. Where would we put it? A new arena or convention centre would require a large parcel of land. Ultimately it would mean repurposing a tract of land that is likely already occupied by buildings or occupants. With the announcement of the Toys R Us bankruptcy in the US it’s unlikely they will need their Canadian stores for the long term. This could open up redevelopment plans for the owners of the Midtown Plaza, who are already saddled with a 160,000 SF vacancy Sears left behind. The downtown core is a relatively finite area being bordered by the riverbank on two sides, but the City of Saskatoon has determined it could still grow. With the recent news regarding re-routing of the downtown trains, I wonder if the North Downtown Master Plan may be a suitable location. With STC disposing of their property in the immediate area of this plan, there could be some good re-use options to kick off the 25 year vision for this area. There are also some tracts of land that currently occupy surface parking lots that could be assembled. Unfortunately that does bring me to my next point in that we won’t all be driving to the new arena. The idea of a downtown relocation is that visitors would utilize transit to minimize impact of traffic. Is Saskatoon ready for this? As with anything of this magnitude, the idea of the downtown arena is a long way from being decided. I’d love to hear some feedback on where you think a new arena makes sense. Everyone in Saskatoon will get their say in likely a public vote. Let’s just hope we cast the right vote and don’t lose out like we did a few years ago turning down a casino! With the popularity of the Rush, concerts and Blades it would be refreshing to see a multi faceted development downtown. I think the achilles heel is public transit. How do we efficiently get peole in and out of downtown? I agree, Conal. Without an improved and effective transit plan in place I can’t imagine how we’d really consider this as a viable option.